How Does WiFi Work on Planes? Airplane Windows Keep Breaking ??? 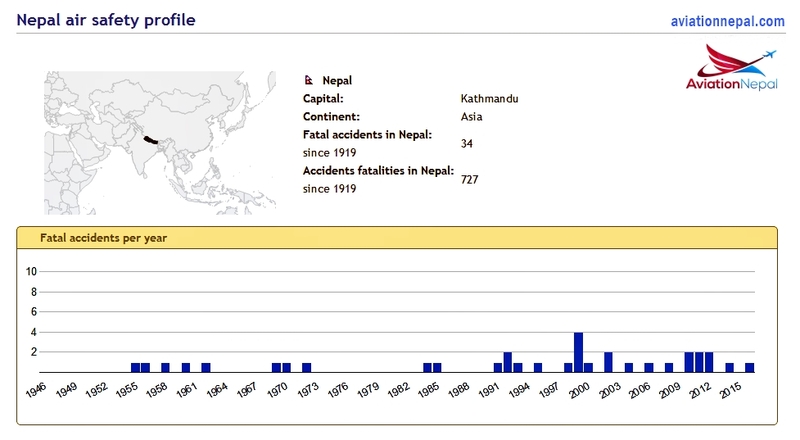 This article is a list of fatal accident and incident of fixed wing aircraft in Nepal since 1955. On 3rd March 1955, Douglas C-47A-25-DK (DC-3) operated by the Kalinga Air, ‘VT-AZX’ crashed while the aircraft was attempting an initial climb from Simra Airport (SIF/VNSI), Nepal. The aircraft was forced to lift off beyond the takeoff speed because of a man crossing the runway. The DC-3 Stalled and crashed with two fatalities. On 5 November 1960, Douglas C-47A-80-DL (DC-3) operated by Royal Nepal Airlines, ‘9N-AAD’ crashed on takeoff from Bhairawa Airport (BWA/VNBW) and caught fire. All four crew member were killed. There were no passengers onboard. On 1 August 1962, Douglas C-47-DL (DC-3) operated by Royal Nepal Airlines, ‘9N-AAH’, it was the flight was en route to from Kathmandu-Gaucher Airport at 12: 21 for a flight to New Delhi. It was scheduled international passenger’s flight. The aircraft crashed near Tulachan Dhuri of Nepal due to the drifting of aircraft to the north of its track, towards the high mountainous terrain, under instrument meteorological conditions with ten fatalities including crew. On 12 July 1969, Douglas DC-3D operated by Royal Nepal Airlines, ‘9N-AAP’, the flight was a scheduled domestic flight from Tribhuvan International Airport (KTM/VNKT) to Simra Airport (SIF/VNSI) which collides with a tree while traversing a cloud covered ridge at 7000 feet msl near Hetauda killing 35 passengers including 4 crew onboard. 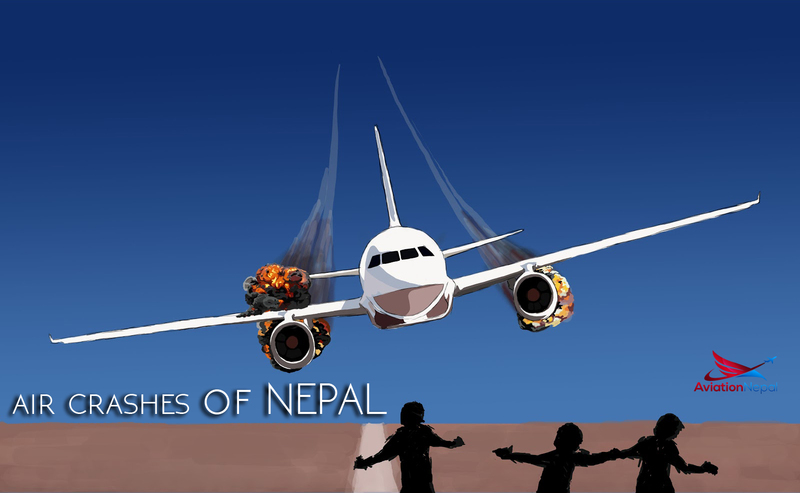 On 27 February 1970, Royal Nepal Airlines crashed near Paachkal killing one soul on board. On 10 May 1972, Douglas DC-8-33 operated by Thai Airways International, ‘HS-TGU’, the scheduled International passenger’s flight which touchdown the runway far and overshoot the runway and crossed a concrete drain at TIA (KTM/VNKT), Nepal. All the passengers and crew were reported safe but was ground casualties with 1 fatality. On 19 November 1981, Royal Nepal Airlines Crashed in Biratnagar with 10 Fatalities onboard. On 31 July 1992, Airbus 310-304 operated by Thai Airways International, ‘HS-TID’, the scheduled International passenger’s flight en route Bangkok-Don Muang International Airport (BBK/VTBD) to Tribhuvan Airport (KTM/VNKT) crashed 40 KM ( 25 mls) North of Kathmandu Airport. The probable cause for the crash is assumed as the Navigational Error and Controlled Flight into Terrain (CFIT). On 28 September 1992, Airbus 300B4-203 operated by Pakistan International Airlines, ‘AP-BCP’, the scheduled International passenger’s flight (PK-268) en route Karachi International Airport (KHI/0PKC) to Kathmandu-Tribhuvan Airport (KTM/VNKT) crashed 18 KM ( 11.3 mls) North of Kathmandu Airport. The Airbus crashed into a steep cloud-covered hillside at approx. 7300 feet amsl., at 9,16 DME near Lalitpur killing 167 soul onboard. The cause behind the crash is that one or both pilots consistently failed to follow the approach procedure, inadvertently adopted a profile and Controlled Flight into Terrain (CFIT). On 31 July 1993, Everest Air crashed near Bharatpur killing 19 souls onboard. On 17 January 1955, de Havilland Canada DHC-6 Twin Otter 300 de Havilland Canada DHC-6 Twin Otter 300 operated by Royal Nepal Airlines, ‘9N-ABI’, the Scheduled Domestic Passenger flight en route Kathmandu-Tribhuvan Airport (KTM/VNKT) to Rumjatar Airport (RUM/VNRT) crashed at T.I.A, Kathmandu during takeoff. The cause behind the crash is the aircraft after 1250 m of runway and 250 m clearway, the Twin Otter couldn’t be airborne and aircraft was plunged into some fields with 2 fatalities. On 21 August 1998, de Havilland Canada DHC-6 Twin Otter 300 operated by Lumbini Airways, ‘9N-ACC’ it was the Scheduled Domestic Passenger flight enroute Jomsom Airport (JMO/VNJS) to Pokhara Airport (PKR/VNPK) crashed killing 18 souls on board. The probable cause for the accident was the airplane impacted Mount Annapurna at the 7000 ft level and crashed near Ghorepani. On 18 January 1999, Cessna 208 Grand Caravan operated by Necon Air, ‘9N-ADA’ the Scheduled Domestic Passenger flight en route Jumla Airport (JUM/VNJL) to Nepaljung Airport (KEP/VNNG) crashed during takeoff from Jumla Airport killing 5 souls onboard. The probable cause for the accident was due to the crew failure to put the aircraft in takeoff configuration. It seems that in all probability, the crew failed to carry out takeoff check-list and rolled the aircraft with full flaps up position at the critical time, which in turn resulted in premature steep take off and consequently the aircraft was stalled at an altitude not enough for stall recovery for the aircraft. On 7 July 1999, Boeing 727-243F operated by Lufthansa Cargo Airlines (Hinduja Airlines), ‘VT-LCI’ was the cargo flight carrying about 21 tons of cargo en route Kathmandu-Tribhuvan Airport (KTM/VNKT) to Delhi-Indira Gandhi International Airport (DEL/VIDP), India crashed 11 km (6.9 mls) South-West of Kathmandu-Tribhuvan Airport (VNKT/KTM) killing 5 souls on board. The probable cause for the accident was the crew after takeoff did not adhere to the published Standard Instrument Departure (SID) procedure for runway 20 at Kathmandu, Nepal. On 5 September 1999, British Aerospace BAe-748-501 (Srs. 2B) operated by Necon Air, ‘9N-AEG’ the Scheduled Domestic Passenger flight en route Pokhara Airport (PKR/VNPK) to Kathmandu-Tribhuvan Airport (KTM/VNKT) crashed during the approach phase near 15 km west of Kathmandu, while approaching Tribhuvan Airport runway 02, the aircraft collided with a communication tower of Nepal Telecommunication Corporation and crashed in a wooded area killing 15 onboard. On 25 December 1999, de Havilland Canada DHC-6 Twin Otter 300 operated by Skyline Airways, ‘9N-AFL’ the Scheduled Domestic Passenger flight en route Simra Airport (SIF/VNSI) to Kathmandu-Tribhuvan Airport (KTM/VNKT) crashed 5 minutes after takeoff near Simra Airport (SIF) killing 10 onboard. On 27 July 2000, , de Havilland Canada DHC-6 Twin Otter 300 operated by Royal Nepal Airlines, ‘9N-ABP’, the Scheduled Domestic Passenger flight en route Bajhang Airport (BJH/VNBG) to Dhangadhi Airport (DHI/VNDH) crashed near Jarayakhali Hill, Dhangadi killing 25 onboard. The cause for the accident was the aircraft collided with pine trees on the 4,300 feet Jarayakhali hill on the Churia mountain range, also known as Sivalik Hills, before catching fire. On 17 July 2002, de Havilland Canada DHC-6 Twin Otter 300 operated by Skyline Airways, ‘9N-AGF’, the Scheduled Domestic Passenger flight enroute Jumla Airport (JUM/VNJL) to Surkhet Airport (SKH/VNSK) crashed 18 minutes after takeoff from Surkhet Airport (SKH) near 10 km (6.3 mls) North to the airport site. The cause for the accident was the aircraft at an altitude of about 6500 feet crashed into trees and crashed against the Gargare Danda hill due to the bad weather. On 22 August 2002, de Havilland Canada DHC-6 Twin Otter 300 operated by Shangri-La Air, ‘9N-AFR’, the Scheduled Domestic Passenger flight enroute Jomsom Airport (JMO/VNJS) to Pokhara Airport (PKR/VNPK) crashed at 5 km (3.1 mls) South-East of Pokhara Airport. The cause for the accident was the aircraft crashed against a hill which was under complete cloud cover following 3 days of continuous rains. Since, four years ago in August 21, 1998 another Twin Otter aircraft operated by Lumbini Airways ‘9N-ACC’ crashed on the same route at the same location, also with all 18 fatalities. On 25 May 2004, de Havilland Canada DHC-6 Twin Otter 300 operated by Yeti Air, ‘9N-AFD’, the Scheduled Domestic Passenger flight enroute Kathmandu-Tribhuvan Airport (KTM/VNKT) to Lukla-Tenzing-Hillary Airport (LUA/VNLK) crashed into the Lamjura hill while on approach to Lukla with 3 fatalities. The causes for the crash as per the Nepalese accident investigation committee they notified that the captain provided false information to the Area Control Centre by declaring that he was proceeding south of the track while proceeding along the direct track all the time. On 21 June 2006, de Havilland Canada DHC-6 Twin Otter 300 operated by Yeti Air, ‘9N-AEQ’ the Scheduled Domestic Passenger flight en route Surkhet Airport (SKH/VNSK) to Jumla Airport (JUM/VNJL) crashed near 0,5 km (0.3 mls) East of Jumla Airport (JUM) with 9 fatalities. The probable cause of the accident to be the crew’s attempt to make a sudden go-around while close to R/W 09 threshold with a very low circuit altitude and subsequent attempt to turn in a tight circuit with excessive angle of bank that led to a stall. On 8 October 2008, de Havilland Canada DHC-6 Twin Otter 300 operated by Yeti Air, ‘9N-AFE’ the Scheduled Domestic Passenger flight en route Kathmandu-Tribhuvan Airport (KTM/VNKT) to Lukla-Tenzing-Hillary Airport (LUA/VNLK) the aircraft contacted rocks near the runway, crashed and caught fire with 18 fatalities. According to a member of the government investigating panel the cause for the accident was the crew made incorrect judgment of information on deteriorating weather condition and flew the aircraft into a patch of cloud. On 24 August 2010, Dornier DO 228-101 operated by Agni Air, ‘9N-AHE’ the Scheduled Domestic Passenger flight enroute Kathmandu-Tribhuvan Airport (KTM/VNKT) to Lukla-Tenzing-Hillary Airport (LUA/VNLK) crashed near Bastipur, Shikharpur VDC, Makwanpur District killing 14 onboard. On 15 December 2010, de Havilland Canada DHC-6 Twin Otter 300 operated by Tara Air, ‘9N-AFX’ the Scheduled Domestic Passenger flight en route Lamidanda Airport (LDN/VNLD) to Kathmandu-Tribhuvan Airport (KTM/VNKT) crashed into Palunge Hill near Sri Chaur Village, Okhaldhunga District killing 22 onboard. On 25 September 2011, Beechcraft 1900D operated by Buddha Air, ‘9N-AEK’ was scenic flight to Mount Everest from Tribhuvan International Airport (KTM/VNKT) to Tribhuvan International Airport (KTM/VNKT). The accident location was a hill side near Kotdanda, approx. 5,5 km (3 NM) short of the runway 02 threshold and 5 km (2,7 NM) to the east of the extended centerline. On 14 May 2012, Dornier DO 228-212 operated by Agni Air, ‘9N-AIG’ the Scheduled Domestic Passenger flight en route Pokhara Airport (PKR/VNPK) to Jomsom Airport (JMO/VNJS) crashed 5 km (3.1 mls) South-West of Jomsom Airport. According to the head of Nepal’s national rescue department, the pilot told air traffic control moments before the crash that he was diverting back to Pokhara. The airplane crashed into the side of a hill near Marpha village. On 28 September 2012, Dornier DO 228-212 operated by Sita Air, ‘9N-AHA’ the Scheduled Domestic Passenger flight en route Kathmandu-Tribhuvan Airport (KTM/VNKT) to Lukla-Tenzing-Hillary Airport (LUA/VNLK) crashed shortly after takeoff from Kathmandu-Tribhuvan International Airport (KTM) killing all 19 on board. The accident was caused by the overweight of the aircraft. On 16 February 2014, de Havilland Canada DHC-6 Twin Otter 300 operated by Nepal Airlines, ‘9N-ABB’, the Scheduled Domestic Passenger flight en route to Pokhara Airport (PKR/VNPK) to Jumla Airport (JUM/VNJL) crashed when the aircraft was impacted a mountainside near Sandhikhark, Nepal. All 18 on board sustained fatal injuries. On 24 February 2016, Viking air de Havilland Canada DHC-6 Twin Otter 400 operated by Tara Air, ‘9N-AHH’, the Scheduled Domestic Passenger flight en route to Pokhara Airport (PKR/VNPK) to Jomsom Airport (JMO/VNJS) crashed in the Myagdi district, Nepal with all 23 on board suffered fatal injuries. The accident was caused by a loss of situational awareness when entering clouds while flying VFR. On 26 February 2016,PAC 750XL operated by Air Kasthamandap, ‘9N-AJB’ with eleven people on board, crashed at Chilkhaya in Kalikot district,Nepal, killing two crew members and injuring the nine passengers, one critically. The accident occurred only two days after a Viking Air DHC-6-400 Twin Otter of Tara Air crashed in Nepal, killing 23. On 23 November 2016, Bailey-Moyes Dragonfly operated by Avia Club Nepal, ‘9N-ALL’ enroute from Pokhara Airport (PKR/VNPK) to Pokhara Airport (PKR/VNPK). The ultralight plane, engaged in a sightseeing tour, crashed shortly after takeoff under unknown circumstances. The pilot died in the crash, the passenger was seriously injured. On 27 May 2017, Let L-410UVP-E20 operated with registration ‘9N-AKY’-MSN 2917 operated by Goma Air (Summit Air) crashed in an accident when it attempted to land on runway 06 at Lukla-Tenzing-Hillary Airport in Nepal. The precise circumstances are unclear. According to the news reports, the aircraft hit a pine tree before landing. The aircraft was a ferried cargo flight with flight number 509 to Lukla Airport outbound from Tribhuvan International Airport, Kathmandu with three crew members on-board. The Captain and First officer sustained fatal injuries while Cabin Crew was minor injured.